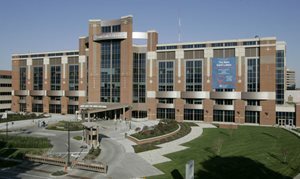 We visited Bruce today at St Luke’s Hospital in Kansas City. What a special time we had with Linda, and we were also able to meet their son (Kevin) and youngest daughter (Katie). What a delightful family. Bruce has been very blessed as a father, husband, and friend to many. Please continue to pray for this special family during this most difficult time. We have been overwhelmed with the care and concerns of others who have reached out to express well-wishes to Bruce. Thank you to everyone! Bruce also has a “CaringBridge” page where you can keep up daily on his progress. You will need to register and log-in to access the updates. We want to especially thank a few people and organizations who have made Bruce’s safe return to Kanas City possible. Also, we wish to thank AirCare International. 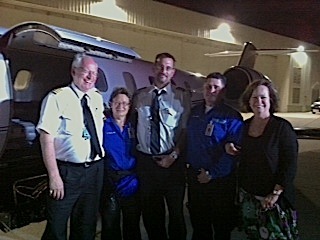 The medical air ambulatory service organization that provided the personnel and technology to bring Bruce home safely. Thank you to the pilots (Jake & Dustin), and the medical staff on board (Donna & Rick). Linda is especially grateful for your commitment and care. Jake, Donna, Dustin & Rick with Linda arriving in Kansas City.